The Navy made history Saturday when it launched the first aircraft from the Naval Air Systems Command, Lakehurst, N.J., test site using the Electromagnetic Aircraft Launch System, or EMALS, technology. The Navy has been using steam for more than 50 years to launch aircraft from carriers. 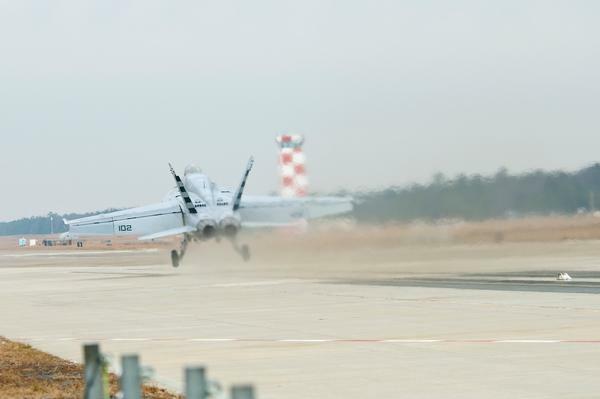 Saturday, the Aircraft Launch and Recovery Equipment (ALRE) program launched an F/A-18E Super Hornet using the EMALS technology that will replace steam catapults on future aircraft carriers. EMALS is a complete carrier-based launch system designed for Gerald R. Ford (CVN 78) and future Ford-class carriers. The current aircraft launch system for Navy aircraft carriers is the steam catapult. Newer, heavier and faster aircraft will result in launch energy requirements approaching the limits of the steam catapult system. The mission and function of EMALS remain the same as the steam catapult; however, EMALS employs entirely different technologies. EMALS will deliver the necessary higher launch energy capacity as well as substantial improvements in system weight, maintenance, increased efficiency, and more accurate end-speed control. 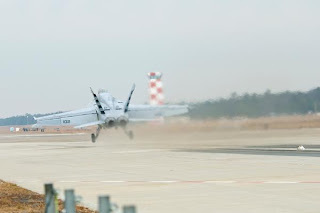 “I felt honored to be chosen as the Shooter to help launch the first live aircraft tested on the new EMALS track at Lakehurst,” said Chief Petty Officer Brandon Barr, Naval Air Warfare Center Aircraft Division Test Department, Lakehurst. “It was very exciting to knowingly be a part of naval aviation history. Petty Officers 1st Class Hunsaker and Robinson, Petty Officers 2nd Class Williams, Wong, and Simmons, were the sailors on my team who worked together to help make this test a success. We all look forward to seeing this cutting edge technology deployed on the Gerald R. Ford." The system’s technology allows for a smooth acceleration at both high and low speeds, increasing the carrier’s ability to launch aircraft in support of the warfighter. The system will provide the capability for launching all current and future carrier air wing platforms – lightweight unmanned to heavy strike fighters. Engineers will continue system functional demonstration testing at NAVAIR Lakehurst. The team will expand aircraft launches with the addition of T-45 and C-2 aircraft next year.